Now a man, Aang looks back on these adventurous years�from being found in the ice to fighting epic battles to negotiating peace. This is Aang�s story, his mementos, and keepsakes. 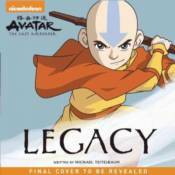 Avatar: The Last Airbender: Legacy is the collection that Aang passes down to his son Tenzin, who will one day be a master Airbender, too. Readers will relish Aang�s heroic tales and the posters, clippings, cards, and maps he gathered along the way!